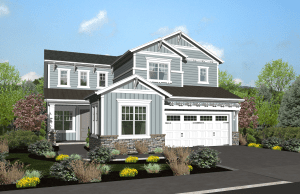 Beautiful new home in desirable Berry Brook community. This sophisticated two-story home is set on a large lot and features 5 bedrooms and 3 bathrooms with two bedrooms and one bath on the main level. Spacious floor plan includes family room, living room, dining room and a chef's kitchen with quartz counter tops, stainless steel appliances, breakfast nook and pantry. All this and conveniently located close to Hwy 101 and all amenities.